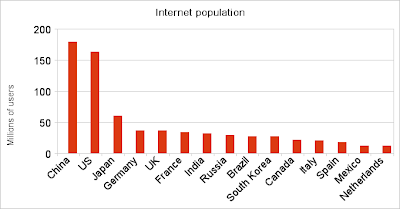 Economist and blogger Justin Wehr has created this handy graph of the top 15 countries by internet population. It uses recent data from comScore, which puts the total number of unique users as of December 2008 at just over one billion. Below is the detailed breakdown. More telling is his third chart, Internet users by total population. You'll see that it is the richer countries that have a high internet use for their population. China is low on the list.